Franciscan Ware dishes manufactured by Gladding McBean and Co. in California from the mid 1930’s to the 1950’s. 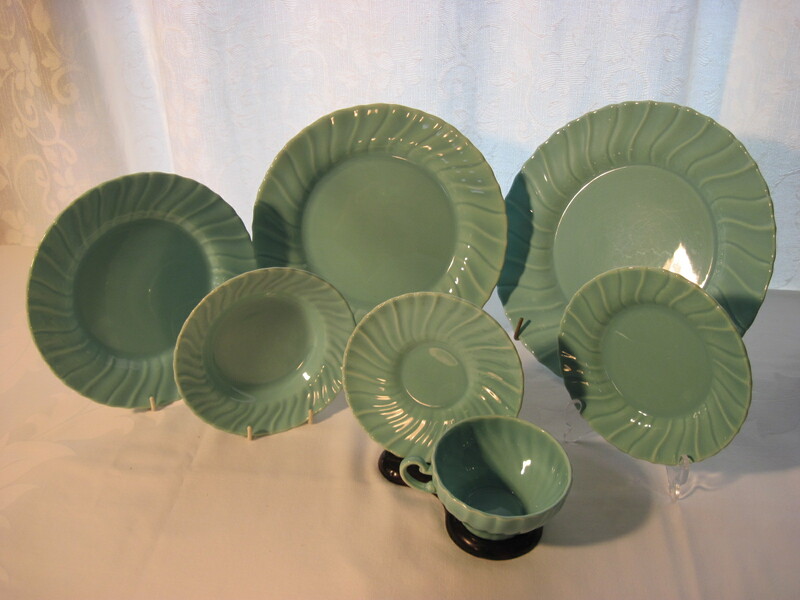 The pattern is called Coronado and the dishes came in Turquoise blue (pictured), Old Rose, Canary Yellow, Poppy Orange and Rust. This is a place setting consisting of dinner plate, large luncheon plate, sandwich plate, dessert plate, cereal bowl, cup and saucer. A place setting is being sold for $45.00. I have 3 dinner plates, 4 luncheon plates, 4 sandwich plates, 4 soup bowls, 4 dessert plates, 2 dessert bowls, 2 cups and saucers in the turquoise. Thank you for posting this! i found a few pieces of the Poppy Orange at the thrift store and was just looking up info on it. Very helpful!! Are you still selling these place settings? I don’t have complete place settings in the turquoise left. I have a few lunch plates and some other pieces only. I have some of this pattern in yellow and burgandy as well but not complete place settings. If you are interested, I will send you photos of what I have available. Contact me at shrike4@rogers.com. Thanks. I have what appears to be a child’s tea set. It consists of four 2 oz cups, four 4 inch saucers and four 6 1/2 inch plates. They are the Coronado pattern and are robins egg blue or turquoise in color. Any information would be appreciated. It does not include any teapot or cream and sugars. Thanks so much. Hi. I have not seen any childs dishes in that pattern. I will have to do some research and see what I can find out for you.